How Much Does Counterbalance Forklift Licence Cost - Be Certified Today! 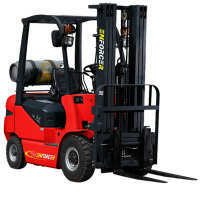 Counterbalance is the most common type of forklift. You will see it in many workplaces as a matter of fact, when we talk about forklift, this what instinctively comes into our minds. As its name suggests, it operates with a counterweight at the rear of the vehicle off-setting the load to be lifted at the front. Many models of counterbalance forklift can be powered with gas, diesel or electric. Being common and its characteristics are what makes it more dangerous to operate. This is why extensive training should be performed when taking such a training course. The aim of the training is to provide you with the sufficient knowledge, practical skills and know-how on associated risks involved in operating such counterbalance in the workplace. Just like any other training, the curriculum is composed of classroom training, practical training and operator performance evaluation. If you are asking how much it would cost to be certified on counterbalance forklift, below is the ballpark figure. If you are in the United States, follow this link: Article. For UK operators, you can enroll in a forklift training course at a school in your area. The list of companies the provide counterbalance forklift training in the United Kingdom are listed below, you can refer to the list. The training course will compose of theory and lectures, practical operator training (actual driving of the forklift truck) and finally performance assessment. For new operators with no prior skills, the course is lengthier that usually lasts for 3 to 5 days and it could cost more. For experienced operator the course takes 2-3 days, for refresher and conversion, it only takes 1 day to complete the course. Successful operators, who have been evaluated, will receive a certificate of training completion, operator card and registration. Their names will be entered into RTITB registry called NPORS database. The forklift licence expires every three years, and in order to renew it, you need to take the refresher course. The training schools can charge up to £80.00 to £90.00/person per day. Other training packages are also being offered by these training companies that usually range from £500.00 to £700.00. The training companies can make a 1:3 trainer-to-trainees ratio in order to give more focus on every operator ensuring each trainee receive sufficient knowledge and skill after the course. Health and Safety at Work etc Act 1974 is the important legislation the gives protection to forklift operators. This legislation ensures that the forklift operator receives careful understandings of their everyday jobs. With this legislation, training schools ensure your competency upon course completion. We have listed here the training providers in the US and UK. Select which one is closest to you. Email or phone them to enquire about your need. If you are seeking training to be conducted in your own workplace, you can make an arrangement with them. On-site training is the most ideal mean to receive the training because the trainer can alter the type, of course, to suit with the current condition of the workplace, makes and specifications of the trucks being used and behavior of the operators they exhibit. By addressing some issues about the operators and workplace, trainer can conduct training to correct them, reducing chances of the accidents. Counterbalance forklift training can consume some of your time but you are assured to collect more wisdom and proficiency driving this type of forklift. The cost may put a small hole in your pocket but it is your investment for long term career. Training schools are the place to go. You cannot be trained by online providers just go out there and get your counterbalance forklift licence.